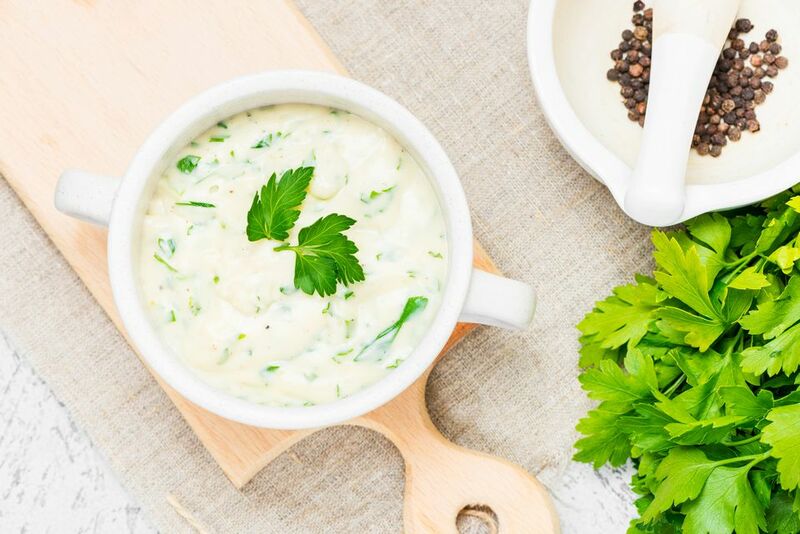 If your memories of English Parsley Sauce are school dinners as a child, then, like me, you may have long put the parsley sauce recipe well out of reach. Those memories involve a thick, gloopy sauce, often only lukewarm. The sauce, unsurprisingly, fell out of favor, and for the longest time have disappeared save a few packet sauces on the market. What a shame, as parsley sauce is actually a really delicious, quick and simple sauce to make and will jazz up many a piece of fish, or baked ham. It is firmly back on my repertoire and I am happy to report, I am now seeing it regularly making a comeback in restaurants too. Parsley is the classic herb in this dish but there are other tasty alternatives, see the notes below. In a medium-sized saucepan, melt the butter over a medium heat. Stir in the flour and mustard if using. Stir thoroughly and a thick paste will form but don't worry. Cook gently for a further 2 to 3 minutes, watch the heat to ensure sure the paste does not burn. Gradually stir in the milk. I prefer to use a whisk, as I find it easier, but a wooden spoon is fine. Bring to the boil, lower the heat and simmer for 5 minutes, stirring frequently to make sure there are no lumps. The sauce should be quite thick but still a pouring consistency, if too thick add a little more milk. Add a good pinch of sea salt and a few grinds of black pepper, taste and add more to taste. Keep the sauce warm until needed. If you need to keep the sauce longer than about 15 minutes I recommend laying a piece of buttered greaseproof paper on the surface to prevent a skin forming. If a slight skin does form, whisk thoroughly and it should disappear. Serve with fish or ham and enjoy! The sauce will keep covered in the fridge for a day or two, but no longer. Add finely chopped chervil or tarragon and a teaspoon of freshly squeezed lemon juice, great with fish. With boiled or baked ham, reserve some of the cooking liquor and make the sauce with half milk and half stock. Stir in 2 tablespoons finely grated Parmesan cheese and use over cooked vegetables au gratin.